Garmin Technology Precise. Future. Tech. Please purchase all our products from these authorized dealers only to ensure that you receive full support in Warranty and replacement matters. Featuring 120 W of power, GMR Fantom 124 is our most powerful 4’ solid-state radar. It uses MotionScope technology to detect and highlight moving targets in different colors, which helps you avoid potential collisions, find flocks of birds and track weather. It includes Pulse Compression technology that provides high-resolution imaging and maximizes energy to help you detect and identify targets. 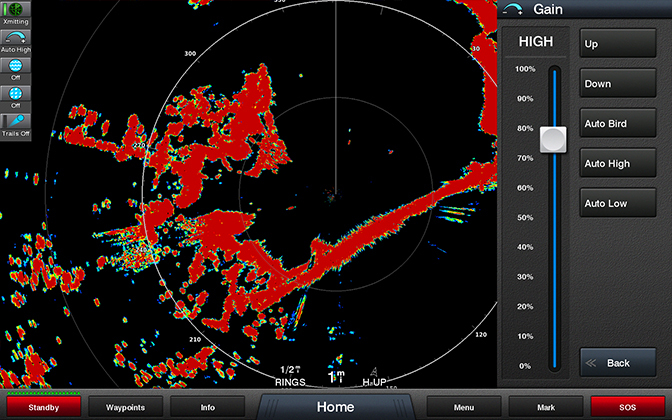 It has a detection range of 20’ to 96 nautical miles. 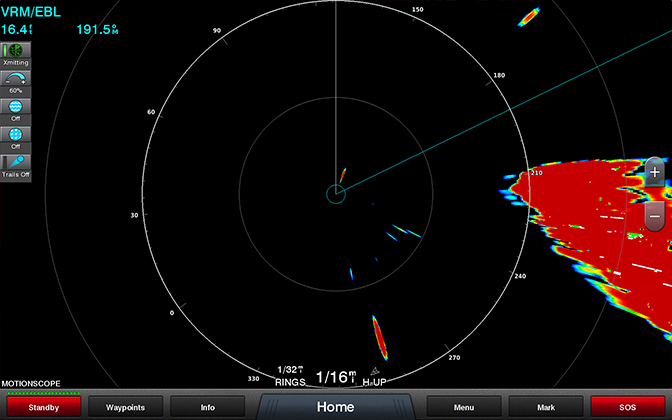 You get excellent close- and long-range target detection from as close as 20’ to 96 nautical miles, even in fog or rain. The narrow horizontal beamwidth provides a high-resolution image, and the high antenna gain picks out weak targets at a distance. 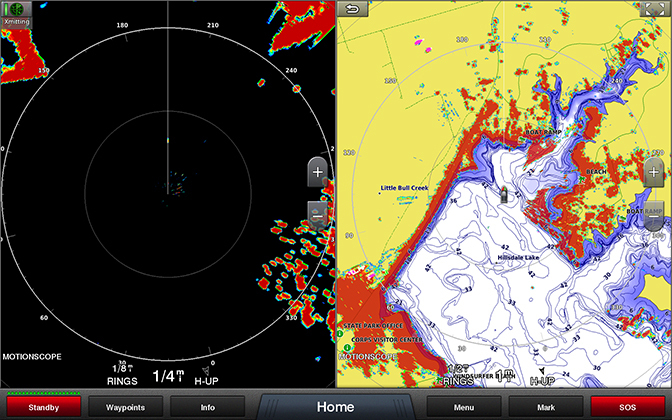 This radar paints a clear, concise image of the shoreline, other vessels and impending weather — right on your Garmin chartplotter. Get consistent target positions, excellent target separation that helps you distinguish large targets from small ones and adjustable rotation speed for fast screen updates. GMR Fantom uses the Doppler effect to detect and highlight moving targets to help you avoid potential collisions, find flocks of birds and track weather formations. The Doppler effect is the frequency shift in the radar echo due to the relative motion of the target. 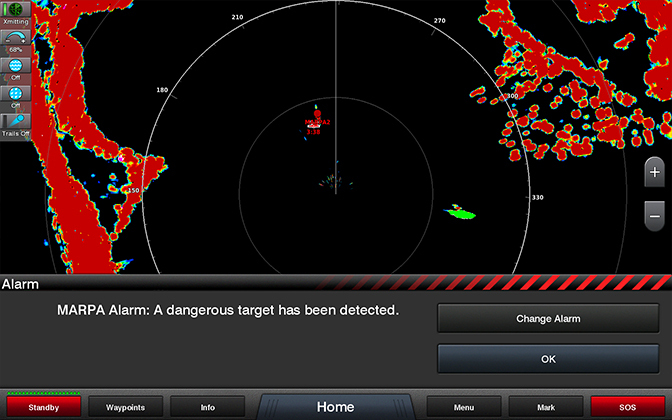 This allows for instant detection of any targets moving toward or away from the radar. MotionScope highlights the moving targets on the radar display so you can navigate around other boats or severe weather — or toward fishing spots where birds are feeding at the surface. A fading “trail” is left on the screen to help you quickly and easily identify moving targets and potential collision threats. 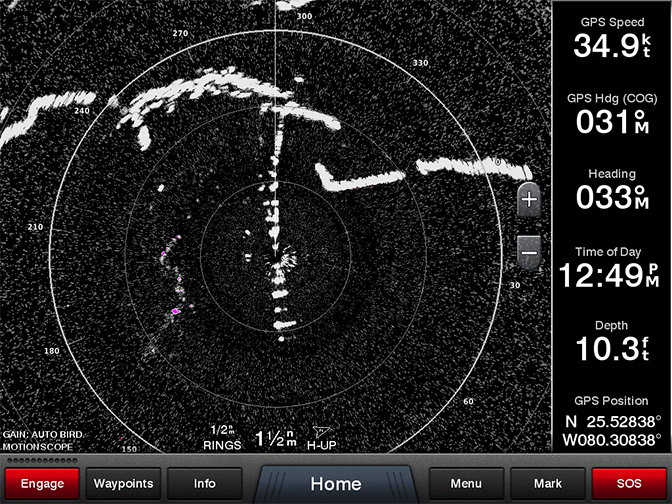 Trails are corrected for your boat’s rotation when an autopilot or heading sensor is connected to your Garmin network. Where there are birds on the water’s surface, there are fish below it. 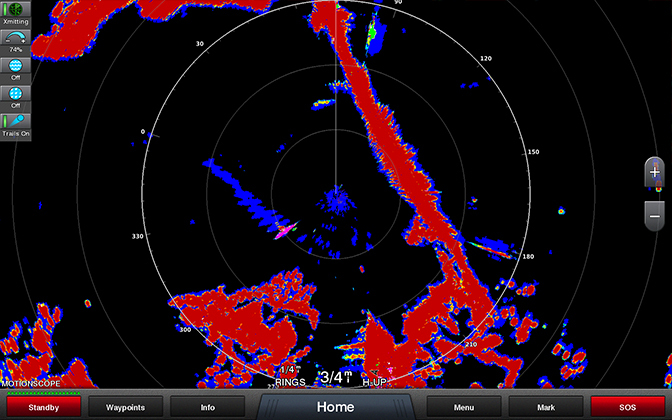 Auto Bird Gain helps you locate flocks of birds at the water’s surface where baitfish are likely to be found. Dynamic Auto Gain automatically adjusts to your surroundings for optimal performance in all conditions. Dynamic Sea Filter automatically adjusts gain to changing sea conditions with user options for low, medium or high filtering. You can increase the size of targets on screen to help differentiate from noise, or reduce the size to sharpen shoreline details. 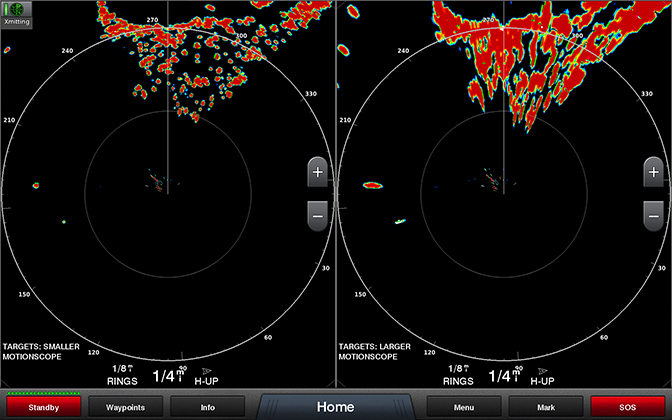 The single radar antenna can display radar images on your chartplotter map page side by side, with independent range settings and controls for both close and long range. One or both ranges can also be viewed as a chart overlay. An autopilot or heading sensor is recommended for best results. 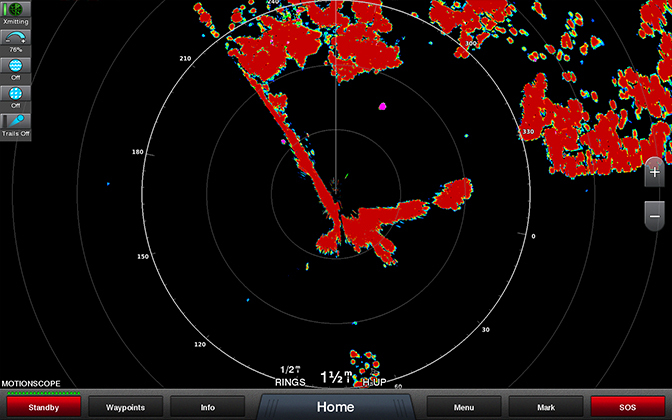 Mini-automatic radar plotting aid (MARPA) tracks up to 10 selected targets, helping you keep track of other vessels and avoid collisions. This provides redundancy and the ability for each display unit on the boat to select data from 1 of 2 different radar sources. Set the safety zone, and receive an alarm when an object enters the zone. Variable range markers (VRM) and electronic bearing lines (EBL) allow rapid measurements of distance and bearing to vessels and land. It fits the selected radar range to the vertical size of your display to show more forward-looking radar returns on screen and make it easier to interpret target distances. 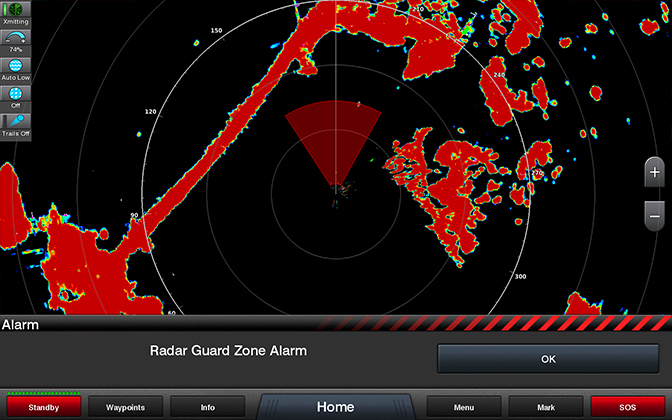 All our radars are designed to be easy to install and easy to use. There are no complex user settings to adjust; just install your radar, and start using it. 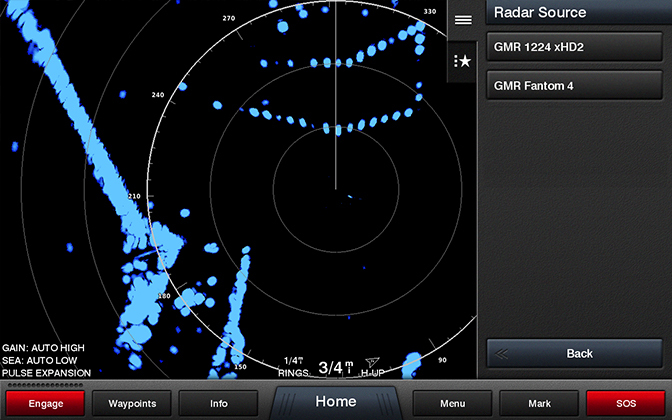 You can rely on the GMR Fantom radar to provide reliable, optimum performance in all conditions. Physical dimensions Pedestal: 16.6" x 14.3" x 10.7"
By downloading, installing, or using this software, you agree to be bound by the terms and conditions of the following license agreement. Please read this agreement carefully. Garmin Corporation ("Garmin") grants you a limited, non-exclusive license to use the upgrade software ("Software") in binary executable form in the normal operation of the applicable Garmin products. 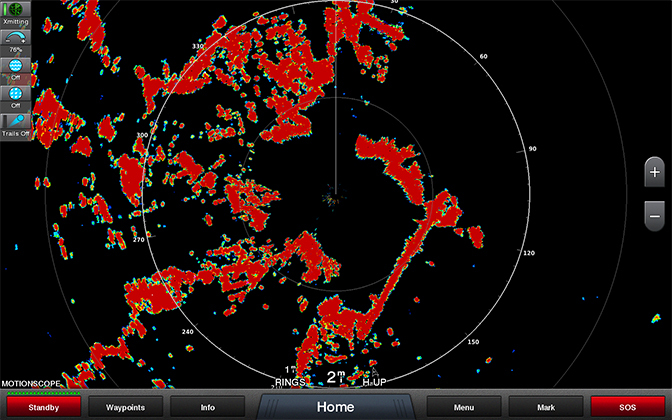 Title, ownership rights, and intellectual property rights in and to the Software remain in Garmin. This license is personal to you and you may make copies of the software only for your personal use. You agree that this license agreement does not need to be signed for it to take effect. The software is provided on an "as is" basis without warranty of any kind — either expressed or implied — including, without limitation, any implied warranties of merchantability or fitness for a particular purpose. Garmin does not warrant the performance of the software or that the software will meet your requirements or operate error free. You acknowledge that this Software is the property of Garmin and is protected under United States of America copyright laws and international copyright treaties. You further acknowledge that the structure, organization, and code of the Software are valuable trade secrets of Garmin and that the Software in source code form remains a valuable trade secret of Garmin. You agree not to decompile, disassemble, modify, reverse assemble, reverse engineer, or reduce to human readable form the Software or any part thereof or create any derivative works based on the Software. You agree not to export or re-export the Software to any country in violation of the export control laws of the United States of America. * Subscribe/Unsubscribe successfully. You may close the window. * Please select Subscribe or Unsubscribe.